Poal is a completely new type of sound absorber compounded with non-woven aluminum fiber and expanded metals and it shows superior broad-banded sound absorption. Porosity of Poal is about 40%, so the specific gravity of it is about 2/3 of aluminum plate. As the material is solid metal like plate and has strong resistance to wind pressure, there is no need to provide front cover, such as perforated metal. Weatherproof and fireproof tests show that Poal has a long life and a non-flammability. Poal is made from pure aluminum, so it can be melted again for other aluminum products. Poal drains water well, thus unlike fiberglass, no lowering in sound absorption efficiency due to water. Poal can be formed into a curved board and cylinder. Drilling, nailing, bolting and other mounting works are easy to do. Unlike fiberglass, Poal is not dispersed in the form of tiny fibers. Thus no problem of pollution arises and handling is easy. Poal can be used for a variety of applications such as the sound absorber for reverberation control in a room, noise barrier and noise reducer for prevention of noise pollution. The ornamental uses are also available after color coating. 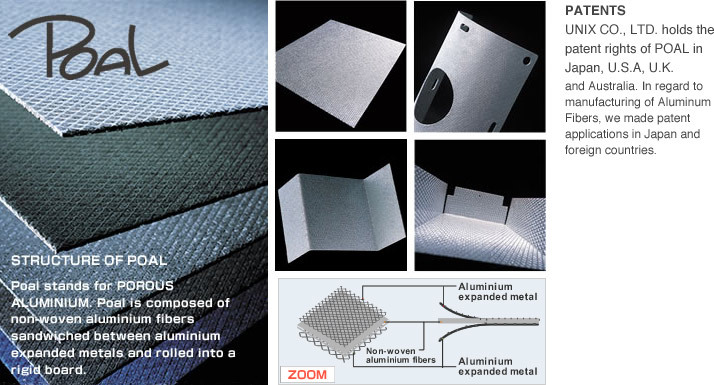 Poal is a porous aluminum board by rolling non-woven aluminum fibers with expanded metals. It is not susceptible to loss of strength over time because it contains no organic binders. ※”TH” means Thickness and the rigidity is risen by using thicker expanded metals. Sound absorptive properties of TH are equivalent to those of no TH. TH is used on the place where the rigidity is needed. Poal can be coated with paints on the surface of it for the purpose of various uses. For coating, we use an unique fluoric resin paints which show excellent weather-proof properties and also can be available to use a polyester resin paints in accordance with the purposes. Before fixing Poal to the objects, water such as rain should be kept away from the bundle of Poal and chose the storage and storage method. If there is a possibility above, a clear coating or a color coating should be adopted on the one side of Poal surface before packing in order to prevent the generation of water-stain on the surface of Poal. Water-stain does not affect the strength and the weather resistance of Poal. It only changes the surface color of Poal. When the Poal is fixed or stored with other material which reacts with water and it`s an effluent shows a color, Poal might be changed the color by the dropped water or the moisture. Copyright 2003-2014 UNIX Co., Ltd. All Rights Reserved.